Architect Sanjay Singhal used Adolphe Mouron Cassandre’s famous 1935 poster of the SS Normandie in this bedroom he designed for a Chicago-area show house. Acclaimed French Art Deco designers decorated the Normandie’s interiors. They covered the floors with Aubusson carpets and glossy geometric marquetry and finished the walls in cream-colored Algerian onyx, parchment and other sumptuous materials. Each deluxe stateroom had its own designer, so no two were alike. The first-class dining room — which at 305 feet was longer than the Hall of Mirrors in France’s Palace of Versailles — glittered with a gold plaster of paris ceiling, mirrored walls, 12 René Lalique light fountains, 38 wall sconces and two chandeliers. 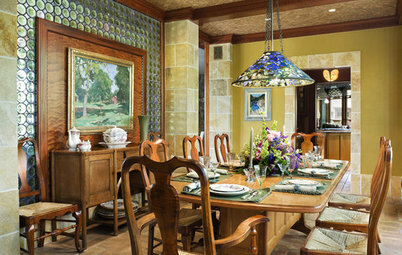 The children’s dining room featured Babar murals painted by the elephant’s creator, Jean de Brunhoff, himself. The smoking room was lined in Jean Dunand lacquer panels that depicted outdoor pursuits in an Egyptian style. It connected to the first-class lounge, which had more Dunand lacquerwork and four more Lalique light fountains. It also contained four 20-foot-high corner murals designed by Jean Dupas and executed by Jacques-Charles Champigneulle, who painted quasi-historical ships and mythical creatures on the back side of glass panels and overlaid that with gold, silver and palladium leaf. 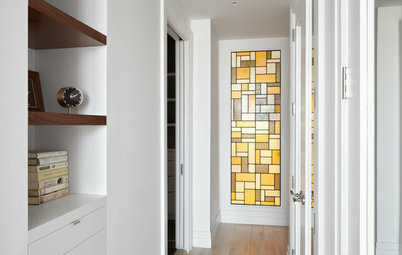 Christianson Lee Studios in New York used this verre églomisé gilding technique to create four large Dupas-inspired murals for Cunard’s RMS Queen Mary 2, which took its maiden voyage in 2004. This one, Australian Menagerie, is 15 by 5½ feet. The Normandie traversed the Atlantic for four years. But the outbreak of World War II in September 1939 stranded it in New York City, and after the attack on Pearl Harbor, the U.S. seized it, renamed it the USS Lafayette and began converting it into a troop ship. As a worker was removing a Lalique light fountain, his blowtorch sparked a fire. The Normandie capsized at its berth in February 1942 and was scrapped. It lives on today in salvaged pieces scattered among public and private collections, in historical photos and grainy footage, and in our collective imagination. 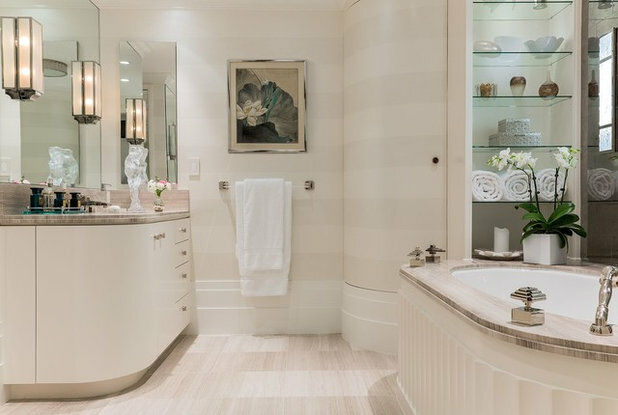 Boston designer Frank Hodge has said he had the Normandie in mind while working on this master bathroom. 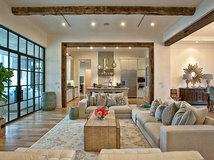 “The vanities are a custom design crafted specifically for this client project,” he says. 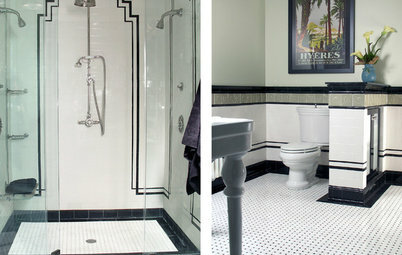 “My client wanted a bathroom with an Art Deco flair, so we designed the pieces with rounded corners. The curved door opens fully.” The faucets are from Sherle Wagner International’s Nouveau collection. 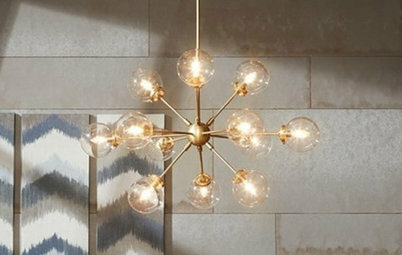 The vanity’s Balmoral wall lights are by Hector Finch Lighting. 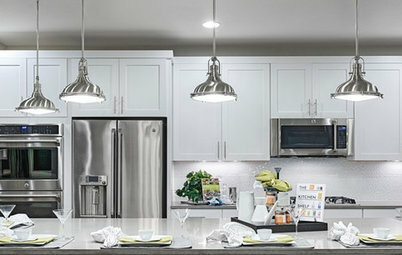 Athens Silver Cream marble from Ann Sacks covers the vanity countertop, bathtub surround and floor for a cohesive look. Stripes painted in two tones pulled from the marble, one in matte and one in an opalescent glaze, swoop around the curved wall. On the bathtub wall, silver pyrite tiles, also from Ann Sacks, shimmer behind the mirror and the two flanking sconces with Lalique glass. 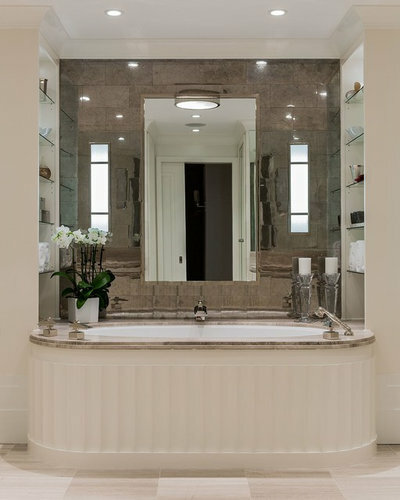 Reflected in the mirror is a Middlebury flush-mount ceiling light by Hudson Valley Lighting, which echoes the fluted-wood facing around BainUltra’s Ellipse tub. People weren’t captivated just by ocean liners; they took notice of the design of planes, trains and automobiles too. Lalique provided glass panels and French interior designer René Prou created exquisite marquetry for the fabled Orient Express passenger train, which in its heyday was immortalized by British novelist Agatha Christie in her 1934 murder mystery. 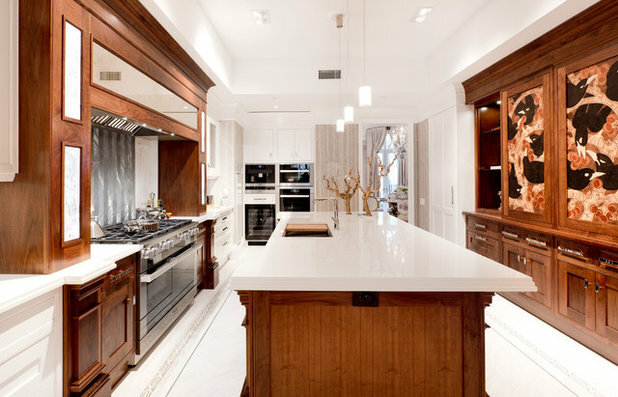 British interior designer Clive Christian brought the feeling of the Orient Express to the kitchen he designed for the 2016 Kips Bay Decorator Show House in New York by incorporating Lalique Merles et Raisins (Blackbirds and Grapes) glass panels into the walnut range surround. 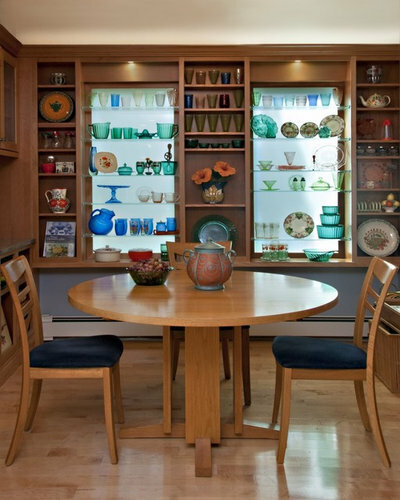 Across the room, he repeated the Lalique pattern in a cocktail cabinet handcrafted from eight veneers, including bird’s-eye maple, burr walnut, sapele and cherry. The stepped edge of the countertops, created by three slabs of Cosentino’s Dekton Xgloss in Halo, provides another Art Deco detail. California native Marion Dorn designed carpets for the Normandie’s British rival, Cunard’s RMS Queen Mary, and the Colindale moquette (a thick pile fabric) for the London Underground, which set the standard for stylish and durable subway seat textiles in the city. 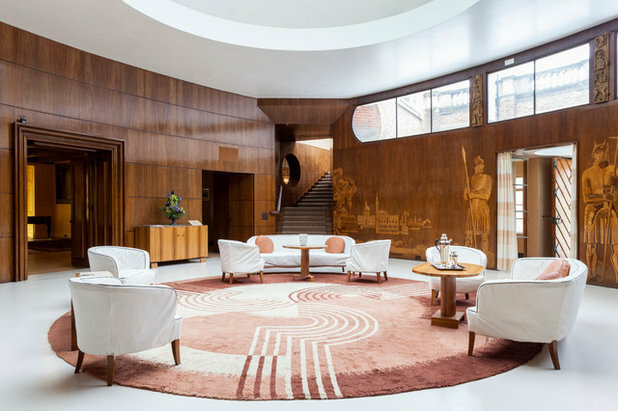 She also designed this sculptural hand-knotted rug for the entrance hall of Eltham Palace, King Henry VIII’s childhood London home, during a controversial 1930s renovation. 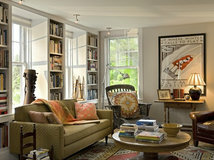 (Like the furniture, the rug is a replica of the original.) It picks up the tones in the Australian black-bean veneer paneling, inlaid with images reflecting the Swedish and Italian heritages of Rolf Engströmer and Virginia Courtauld, the designer and the owner at the time. The porthole in the staircase wall nods to the era’s ocean liners. As the Depression deepened and the threat of war intensified, many designers referenced modern transportation — and the hopeful progress it symbolized — with aerodynamic shapes, industrial materials and motion-suggesting parallel lines called speed whiskers. In the U.S. especially, they gave the streamlining treatment to architecture, interiors and consumer goods. 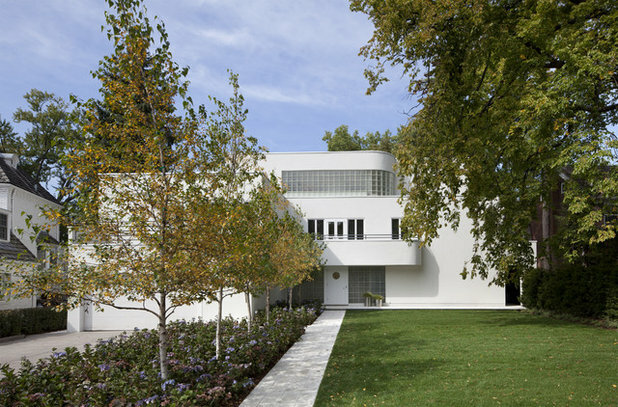 This 1935 home on Minneapolis’ Cedar Lake, expanded with a third-story addition by Peterssen/Keller Architecture, alludes to an ocean liner with its white walls and steel pipe railings. 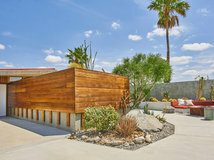 Its horizontality and curved glass-block walls are also characteristic of the Streamline Moderne style. Streamlining brought a sense of glamour even to everyday products, such as housewares and electronics. The concentric rings on these Fiesta earthenware pitchers, incorporated into a project by Southern California designer Natalie DiSalvo, highlight their dynamic shape. English ceramist Frederick Hurten Rhead designed the dinnerware line for Homer Laughlin China of West Virginia, which introduced it in 1936. 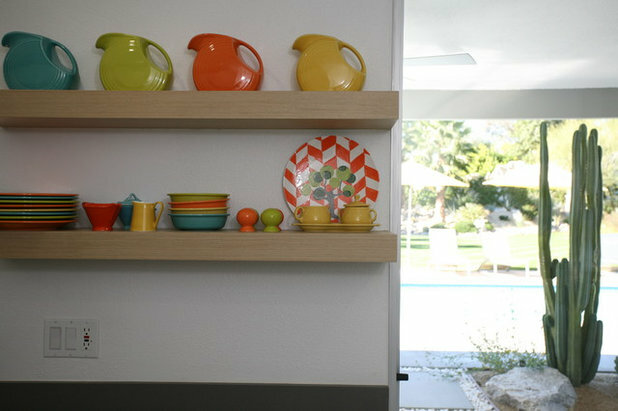 Fiesta’s cheerful colors, mix-and-match versatility, sturdiness and affordability made it a favorite for American dining tables during the dark days of the Depression and beyond. Fiesta’s original semireflective glazes were red, ivory, cobalt blue, yellow and green. Colors have come and gone over the years. 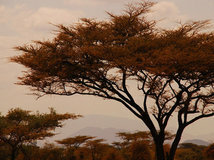 Red, which contained uranium oxide, disappeared due to wartime restrictions from 1943 to 1959, and Fiesta production stopped entirely from 1973 to 1986, when earth tones were popular. Today, Fiesta is available in 14 uranium- and lead-free colors. 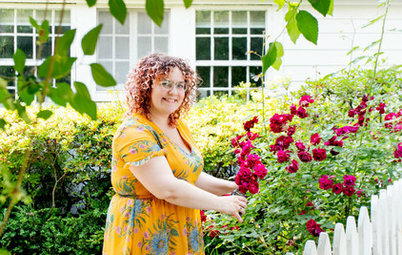 New for June 2019 is Meadow, Fiesta’s 51st shade. The minty green is replacing Sage, introduced in 2015. Fiesta, also called Fiestaware, was fairly inexpensive. Clear and delicately tinted glassware, however, was often gotten for free as purchase incentives in cereal boxes or at gas stations. New acid-etched molds had made glass production so fast that one manufacturer, Anchor Hocking in Ohio, went from making one piece a minute to 90 pieces a minute. Like Fiesta dinnerware, the pretty glassware was a cheerful note then and remains collectible today. 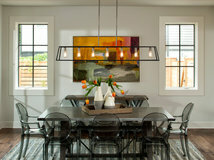 Displayed against pebbled-glass windows, this collection gives a dining nook in a Massachusetts home by Inner Visions Interiors a focal point while hiding an unattractive view. Bialetti’s 1933-patented Moka Express was a welcome money saver in Italian kitchens since it enabled people to make cafe-style espresso at home. The octagonal aluminum pot, which brews coffee with steam pressure, married functionality with a charming shape and a novel material. 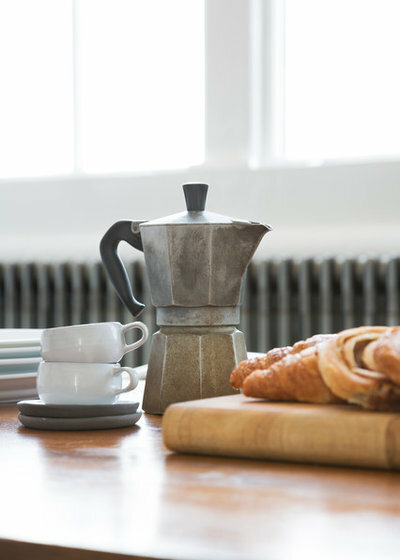 Although coffee lovers worldwide still have a soft spot for the pot, pictured here in Element Studios’ renovation of a restaurateur’s London apartment, the company’s future is uncertain. Coffee pods have been eating into Bialetti’s business, prompting the company to seek bankruptcy protection late last year. It’s enough to make the late Renato Bialetti, son of company founder Alfonso, turn over in his Moka-shaped urn. British engineer George Carwardine took what he learned designing vehicle suspension systems and applied it to task lighting in 1932. He used springs to connect a cup-shaped head, adjustable arms and a square foot for the utmost in flexibility and stability. 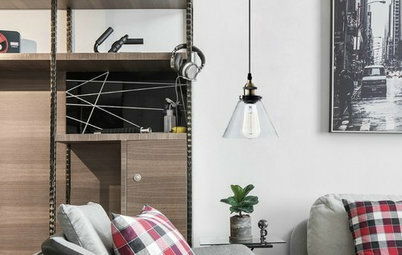 Today his Anglepoise articulated lamps come in desk, wall, floor and ceiling versions and several sizes. They’ve also been reengineered for outdoor use. English landscape designer Kate Gould included this giant one in her award-winning garden for the 2017 Royal Horticultural Society Chelsea Flower Show in London. If your only experience with this type of lamp is through Pixar Animation Studios’ cute little mascot, note that it’s based on Luxo’s look-alike L-1, designed by Jac Jacobsen in Norway in 1937. 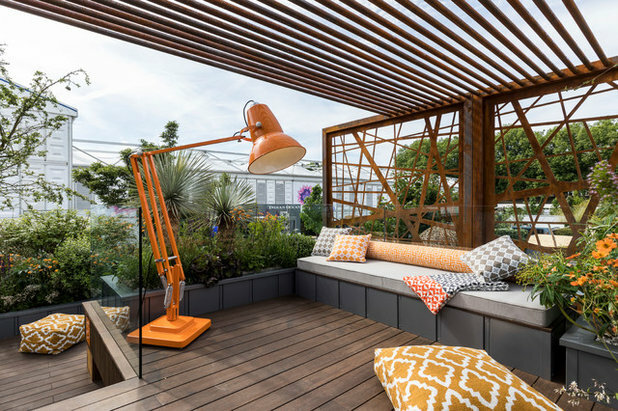 Zinc roofer Xavier Pauchard pioneered the domestic use of rust-resistant galvanized steel in France, establishing his Tolix brand of metal furniture in 1927. Seven years later, he designed a sturdy, light and easy-care outdoor chair with holes in the seat to shed water. 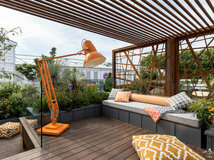 The Marais A chairs were snapped up for factories, hospitals, cafe patios, public parks and even the Normandie’s decks. But the reviews were so-so until Pauchard went back to the drawing board to make them stackable. 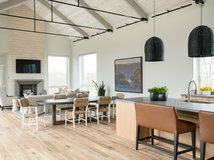 The chairs find favor indoors as well, especially in such rustic-industrial settings as this family dining room in Texas. The industrial aesthetic didn’t sit entirely well in Scandinavia, with its handicraft tradition, abundant forests and cold climate. Although an attempt in Sweden to promote functionalism, standardization and mass production influenced housing, it also prompted a counterreaction. “Steel and chromium surfaces are not satisfactory from a human point of view,” Finnish architect-designer Alvar Aalto said, citing their thermal conductivity and reflectiveness. Preferring the beauty and warmth of wood, he supposedly was thinking of his laminated cross-country skis when he and his architect-designer wife, Aino, began to experiment with bending birch and birch plywood. 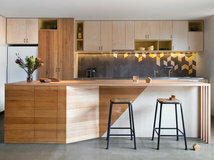 By softening the wood with steam, they were able to shape it into gentle curves. 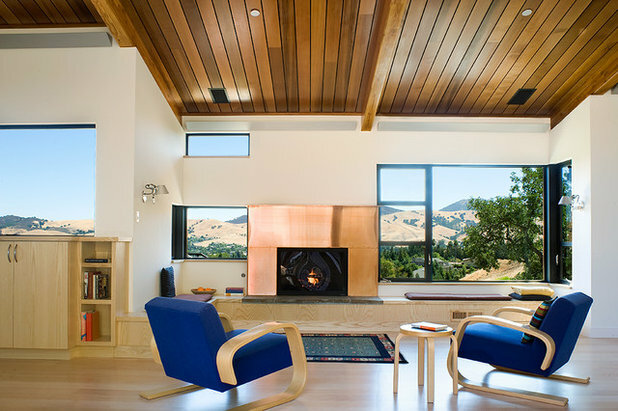 Two Aalto classics — the cantilevered Tank chairs and the laminated birch stacking stool — anchor this living space in a Northern California house designed by Fernau & Hartman Architects. 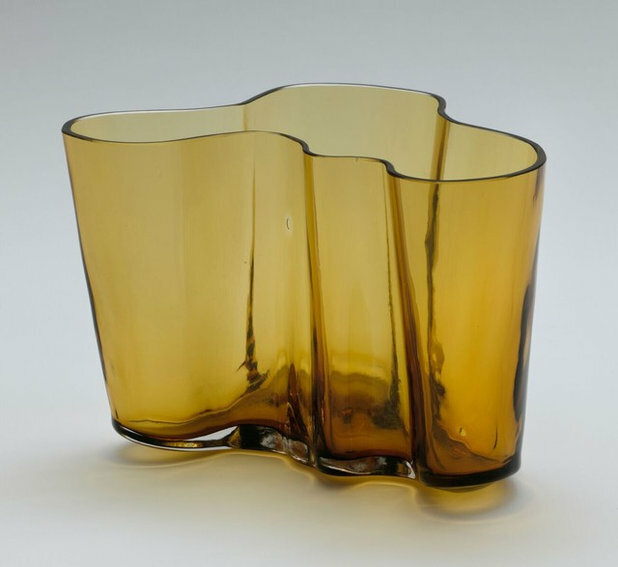 In 1935, the Aaltos and two associates founded pioneering Finnish design company Artek, whose name combines “art” and “technology.” A year later, Alvar’s series of glass vases won first prize in a contest by Finnish glassmaker Karhula-Iittala leading up to the International Exposition of Art and Technology in Modern Life in 1937 in Paris, where they debuted. The vases also graced the tables of Helsinki’s new Savoy restaurant, which the Aaltos were responsible for furnishing. Some say that the folds of a Sami woman’s leather breeches inspired the design; others say it was the waves — the English translation of Aalto — on Finland’s many lakes. In any case, flowers fall naturally into the organic curves of Iittala’s handblown icon of Finnish design. Frank Lloyd Wright’s pursuit of his ideal organic architecture — in which art and nature, structure and site, are in complete harmony — left him largely removed from design trends in the States and abroad. 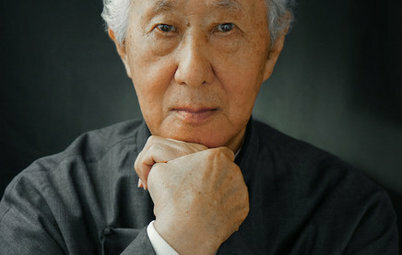 By the mid-1930s, he was nearing 70 and focused on writing and teaching at his architecture school. It was there that he met Edgar Kaufmann Jr., the son of prominent Pittsburgh retailers. The Kaufmanns commissioned a weekend retreat in the rural hills of southwestern Pennsylvania, and Wright designed a tiered house made of concrete, glass, steel and local sandstone. 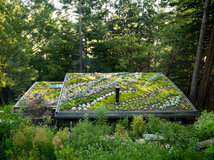 To their surprise, he cantilevered the tiers over the site’s waterfall instead of positioning the house with a view of it. 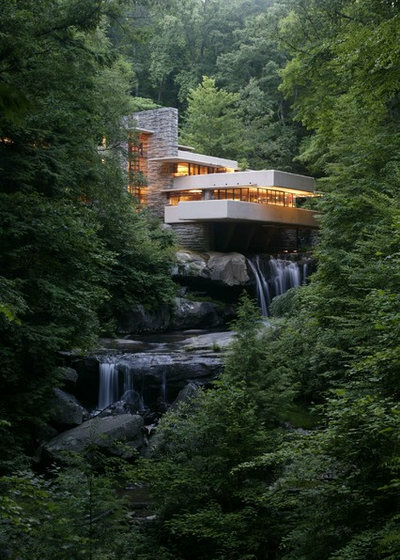 Many consider Fallingwater to be his masterpiece. As was his way, Wright designed the furniture for Fallingwater himself, calling for much of it to be built-in or, as he described it, “client-proof.” But that didn’t keep the Kaufmanns from putting their own mark on the house with personally chosen pieces. And those included one of the first butterfly chairs (aka the BKF or Hardoy chair). 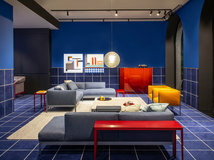 The chair’s designers — Antonio Bonet, Juan Kurchan and Jorge Ferrari Hardoy — had met as assistants in Le Corbusier’s studio in Paris and formed their own group in Buenos Aires. They based their 1938 design on a folding wooden sling chair created in the 1850s for use by the British military. When they introduced their residential version — a leather sling suspended on a base of curved tubular steel — at an exhibition, it attracted the attention of Edgar Kaufmann Jr., then head of the industrial design department at New York’s Museum of Modern Art. He requested one for the museum and one for his parents’ house. Design company Knoll, founded in 1938, bought the U.S. production rights to the chair but dropped them after a court determined that it was too similar to earlier chairs to warrant protection. Since then, butterfly chairs of all sorts have populated upscale interiors and dorm rooms alike. Royce Flournoy, owner of Texas Construction, had this pair custom made to get just the right sling color and base size for his Texas farmhouse. 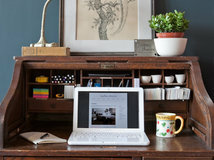 The Parsons table, another now-ubiquitous 1930s-era furniture piece, reportedly resulted from a challenge to students at the Paris branch of Parsons School of Design. French designer Jean-Michel Frank, renowned for his sleek and sophisticated interiors, tasked the students with creating something that would look good whether it was covered in gold leaf or left unvarnished. 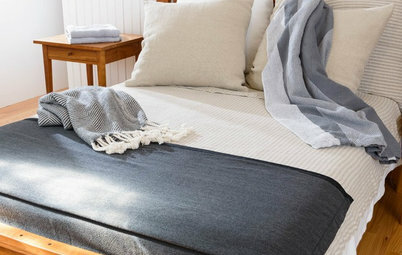 They (whether it was the students or Frank is unclear) came up with a plain table with one defining characteristic: a top whose thickness is equal to that of its square legs. 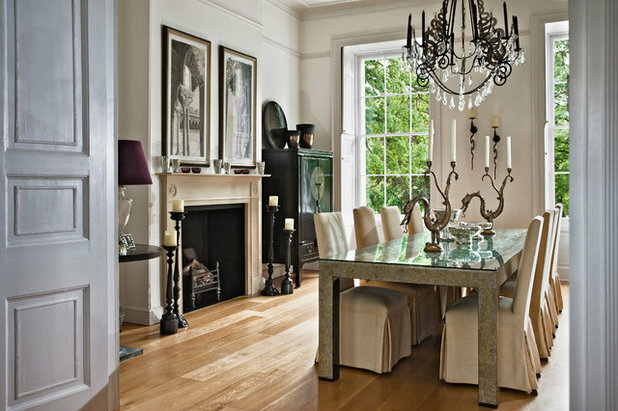 Paired with slipcovered Parsons chairs, this Parsons table in a traditional home by Welsh firm Interiors etc has a finish of mother-of-pearl and eggshell lacquer. Frank loved to use these posh materials — along with mica, shagreen, parchment and straw marquetry — in decorating apartments for the likes of composer Cole Porter, businessman-politician Nelson Rockefeller and railroad heir Templeton Crocker. 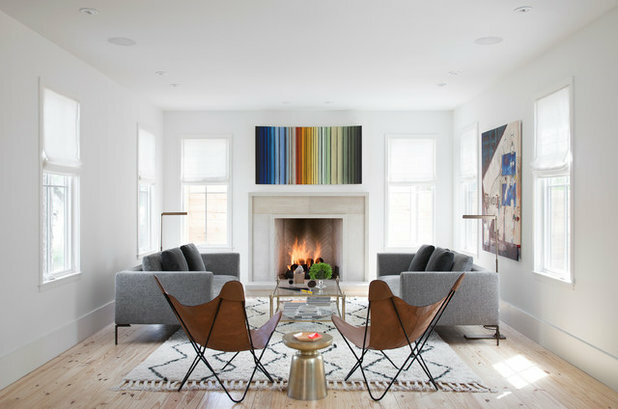 Bruno and Shannon Hervieux are taking some of Frank’s favorite materials for a modern spin. 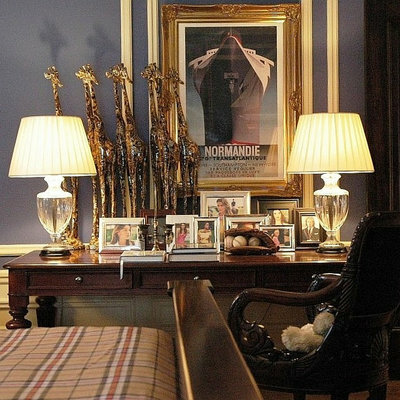 Before founding custom furniture studio Normandie Woodworks in Washington in 2012, Bruno learned woodworking in the Compagnons du Devoir, a French artisans guild dating from the Middle Ages, and then spent a decade in New York’s design world and another 10 years creating custom yacht interiors. Shannon, an artist, recently taught herself straw marquetry. 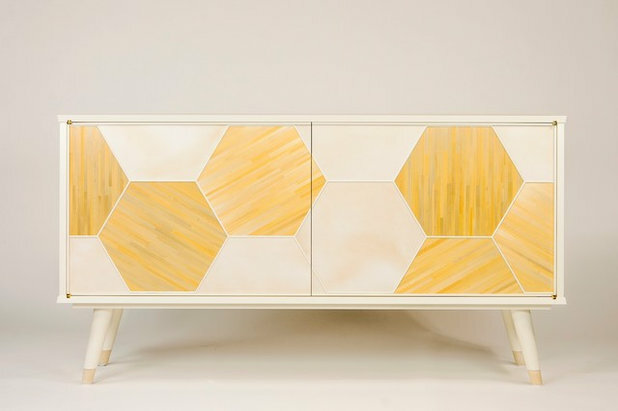 They combined their skills in their Milk & Honey sideboard, which features a honeycomb pattern of French rye straw and parchment on its face, with a cream-colored lacquer surround. The interior is natural sycamore. 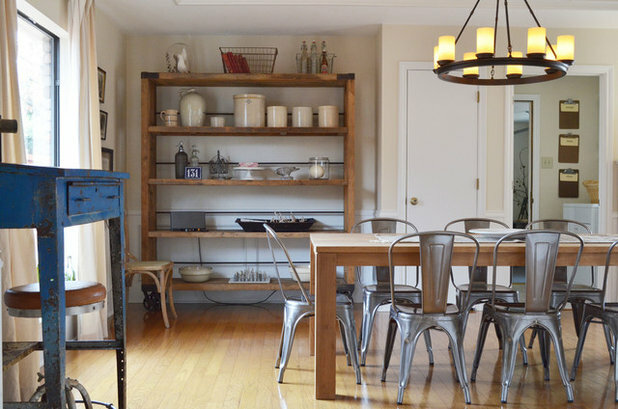 Steven Metal and Wood Bar Stools, Set of 4, 30"
Another amazing article - thank you! !